Herein you’ll find articles on a very wide variety of topics about technology in the consumer space (mostly) and items of personal interest to me. I have also participated in and created several podcsts most notably Pragmatic and Causality and all of my podcasts can be found at The Engineered Network. Not wishing to re-hash the entirety of my previous post a quick refresher about Twinkblogs…Links to full-length Blogs posted as Microblog entries that aren’t intended to convey much other than a title and some brief text, drawing potential listeners to the episode in question. In that regard it’s the size of the audience you can reach through that channel that matters the most. So far as feedback via mentions goes, if you’re interested in comments on your podcast then that’s something worth exploring and whilst Facebook had this functionality I seldom got comments via that page. Any feedback from readers is welcomed to either myself via the feedback form or via the Fediverse directly to me personally. Federation support may someday include embedded audio and the simplicity of being able to consolidate into a single window is quite appealing. Unfortunately I remain concerned that such functionality is unlikely to be as fully featured or as useful as a dedicate podcast client application. For this reason until future support for federated posting via Hugo with embedded audio becomes a reality, it will remain off the table. Lifting the mostly uninteresting curtain behind the TEN Facebook Page, the same number of posts occurred in 2018 as 2017. In 2018 only 3 Likes in 12 months, and all but six Notifications I received on the page came from Facebook helpfully suggesting “…people who like Engineered haven’t heard from you in a while…Write a post…” Uh-huh. Thanks. The reach of these posts expressed as a percentage of Like(s) in the month of December averaged 22%. Some 15 months earlier it exceeded 100% regularly. Early in its life, Facebook encouraged businesses, groups, organisations to host their pages on Facebook for organic growth and a wide distribution. However changes to Facebooks algorithms in the past few years with dozens of weighting factors now used to tweak what people see in their timeline makes trying to get organic visibility essentially impossible unless you want to A) try to game the system (sounds like a full time job) or B) pay $43AUD to reach an additional 3,400 people per day, so claims another ‘helpful’ Notification from Facebook on the page. Uh-huh. No thanks. Currently when a podcast episode goes up on TEN, an RSS Feed scraper takes a copy of the title, a URL link to the episode, then publishes it to a Mastodon account. From there a second script takes that and re-tweets it to the Engineered_Net Twitter account and Facebook is manually added later. With a significant following on Twitter the Engineered_Net account will remain for the immediate future. However the same can not be said of Facebook. Based on the above Twinkblog rationale, manual posting requirements (Facebooks API requires regular re-authentication which is annoying), Facebook asking for money to ‘give back’ organic reach, and finally with my move to gradually step away from Facebook, I’ve decided to close the The Engineered Network page on Facebook. All other subscription methods will remain unchanged including RSS to Causality, Analytical and Pragmatic as well as the TEN Master Feed. My recommendation is that people that have Liked TEN on Facebook and use it for show notifications either follow the TEN Twitter account @Engineered_Net or better still, jump on the Fediverse somewhere and following me @chidgey@pleroma.engineered.space where I’m active every day. Failing that just subscribe in your podcast player app of choice. There’s PocketCasts on Android and iOS, Overcast on iOS, and Apples Podcast app is also much improved in recent times as well. Reflecting on podcast distribution for a moment: It’s funny (okay it isn’t…it’s brilliant!) how an open standard like RSS that powers podcast subscription and distribution remains the best option, whilst centralised platforms like Facebook, once they get big, turn-coat on everyone and charge for visibility. Hopefully this explains why so many people are leaving their Facebook pages and highlights some of the risks of using centralised, company controlled sites for notifications and distribution. This first post in a series about the Fediverse focuses on three aspects as they relate to the future of TechDistortion (this blog): Full-Length Blog Link MicroBlogging, WebMentions and Federation support (ActivityPub/LitePub/OStatus). Links to full-length Blogs posted as Microblog entries don’t intend to convey much other than a title and some brief text, drawing potential readers to the full article. I mentioned the phenomenon of Twinkblogs 5 years ago, but really it’s an avenue of communicating an article exists, not the content of the article itself. In that regard it’s the size of the audience you can reach through that channel that matters the most. IndieWeb are popularising the WebMention as a method of allowing users to reply to a blog or article with the article then able to aggregate all comments, mentions, reblogs as part of the article. Any WebMention compliant site would allow that interaction to occur creating a common point for all comments in a federated way between users from different accounts on different systems, like Disqus but not centralised and more flexible. If you’re interested in comments on your blog then that’s something worth exploring. I’ve never had comments enabled on TechDistortion in the decade I’ve been writing articles and don’t intend to add them now. Any feedback from readers is welcomed to either myself via the feedback form or via the Fediverse directly to me personally. Not all platforms are so text-length restrictive as Twitter (280 characters) and Mastodon (500 characters) with Pleroma allowing administrators to set whatever limit they like. On my Pleroma instance I’ve left it at the default 5,000 characters but might change that at some point in the future. The idea is that using ActivityPub/LitePub a blog could be subscribed to as if it was a regular account on the Fediverse. That seems convenient however scrolling through a 9,000 character long article on a smartphone screen application intended for short posts might not be as clean an experience as a dedicated long-article reading application like Unread (for example). That said, the simplicity of being able to consolidate into a single window is quite appealing. Unfortunately when moving away from Statamic to Hugo, Federation wasn’t a thought I had in mind, and hence since neither supports Federation it will not be explored in the short term. Currently when a blog entry goes up on TechDistortion, an RSS Feed scraper takes a copy of the title, a URL link to the article, then publishes it to a Mastodon account. From there a second script takes that and re-tweets it to the TechDistortion Twitter account. Currently counting the number of actual people and lists on the TechDistortion Twitter account, there are more real people subscribed to the sites RSS Feed directly and also to both my personal Mastodon and old Twitter accounts. Based on the above Twinkblog rationale and also with my move to gradually step away from Twitter, I’ve decided to close the TechDistortion Twitter account. I will instead be posting those links only to my personal Fediverse account, which is copied to my ‘old’ personal Twitter account. RSS will always remain for anyone to subscribe to. My recommendation is that people following the blog on Twitter either follow my ‘old’ Twitter account @johnchidgey or better still, jump on the Fediverse somewhere and following me @chidgey@pleroma.engineered.space where I’m active every day. 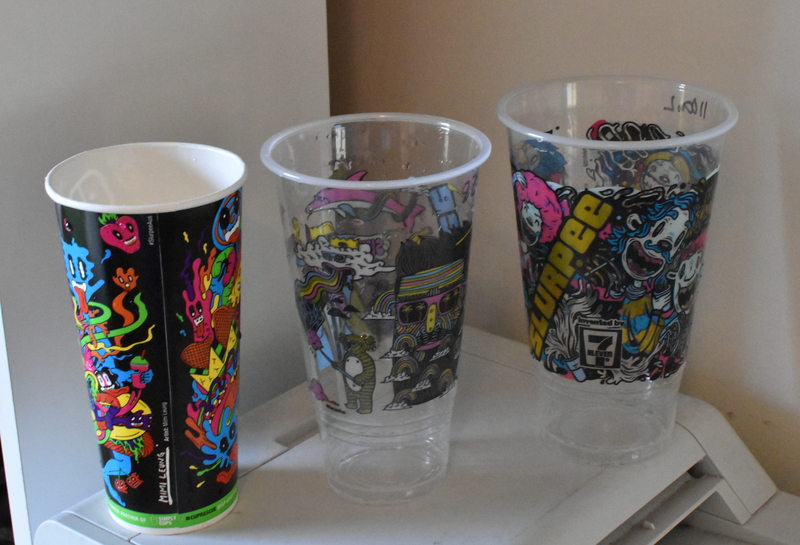 They offer three primary sizes, but if you actually measure the cost per volume it shows how 7-11 are making their money: they want you to upgrade to the bigger drink. Based on the above therefore I’d suggest that if you’re REALLY thirsty, getting x2 Large drinks is the clear winner. Otherwise stick to the $1 size and save your money. Imagine a world where you could pick and choose what server backend you wanted for your social media (if you want to - like picking a bank to bank with? ), pick a social media identity that is truly canonical for all time (you know, like your name is in the real world), and pick whatever application(s) you want to use on your platform of choice so you get to interact the same way no matter who you’re talking to. They’re ALL your choices. Are we there yet? This is the story so far as we all collectively (hopefully) move towards that goal. In April 2017 I wrote about Engineered Space and recorded an episode of Pragmatic about my experiment with Mastodon. I was attempting to ‘take control’ of my Social Graph and Mastodon held a promise of that. The reality hasn’t entirely lived up to expectations for me so far, although I still prefer it to Twitter and Facebook. The truth is that currently Mastodon is still a silo of a sort, which I discovered as I attempted to move to a different platform. When I started @chidgey@engineered.space I had a longer-term intention in mind: purchase a domain that I liked, and then with OStatus and now ActivityPub, it should be possible to use whatever standards-compliant backend server setup I wanted, and I should be able to retain the same Fediverse username for all time. Not only that, I could also then choose whatever front-end client I wanted to and it would connect to the standards-compliant backend server infrastructure I was running. There’s three issues I have: how it’s having its feature-set prioritised, a lack of testing for upgrades with regular mis-steps, and finally it’s resource-hungry. I was running my instance that had only my account on it and about 10 others with minimal traffic, on a VPS with 1.6GB RAM, a reasonable CPU and if I tried to refresh my timeline it would regularly throw a 502 error. Image posts regularly failed, it would also completely fall over once or twice every week requiring a server reboot to recover with no obvious cause. In short, it became a hassle. The production guide to install Mastodon is very good though, with plenty of examples for different Linux distros to install it on and it takes a bit of effort requiring Rails, PostgreSQL, Redis, Sidekiq, NodeJS and ElasticSearch (if you want search functionality at all). It also wouldn’t install and run on Centos 6 and whilst I don’t mind admitting that Centos 6 has had its day, sometimes you can snag a cheap VPS that won’t run Centos 7. Upgrading required a series of git pulls, rake commands and database migrations and could take half an hour to fully compile, requiring me to kill the NGINX server or it would never complete. Lain walks through what Pleroma is and I won’t repeat that but essentially it’s 90% of what Mastodon is but only requires Elixir and PostgreSQL, it runs on Centos 6 (although you won’t find any Production guides for that) and it’s happily running on a Speedy KVM VPS (DAL-VOL0), 1 E3-1230 3.2Ghz CPU, 256MB ECC RAM, 12GB HDD for $18USD/yr. If it keeps chugging along nicely, I’ll fork out for three years for $36USD ($1/month). Not only is it cheap to run, it’s quick. I can refresh and refresh and fill gaps in my timeline and it responds in a second or two and never fails. Uploading images works every time now and if you’re like me and you’re not really into the TweetDeck-esque Mastodon FrontEnd (Pleroma offers this front-end option if you really want it though) then it has a far more Twitter-eque Pleroma FrontEnd that I much prefer. All of the above notwithstanding, there’s a strong beating of the open-source drum by the development team on Pleroma. Whilst Gargon on Mastodon makes no bones with the fact he wouldn’t mind if Twitter collapsed tomorrow, he supports whatever clients, forks of Mastdon, other projects that support ActivityPub in whatever form they might take. The Pleroma team on the other hand have actively and aggressively shamed non-open source developers trying to get more involved with Pleroma. I’ve seen sole developers that are making apps that are free but closed-source, paid and closed-source, and even federated services like Micro.Blog trying to open up connectivity with Mastodon be shunned all becuase they aren’t open source. The future of federation will ultimately be a blend of open and closed source software running on servers and clients from different groups, inividuals and companies around the world, all talking on a common standard or sub-set of standards. The fear that one closed-source player will “take over” neglects the nuance that people will vote with their feet and that if a corporation does wrong by their users, they will eventulally abandon that server for another (like many have abandoned Twitter for Mastodon already). Pleroma need to consider their position in the cross-platform game, supporting other standards to improve operability and usability otherwise they will be outgrown by Mastodon and will become irrelevant before they start. Mastodon provides the ability to export a user list as a CSV: this worked as expected. Pleroma also imported what it could, but when instances are offline (I discovered I wasn’t the only Mastodon instance that was regularly offline) if Pleroma couldn’t verify that an imported user actually existed it wouldn’t add it to the follows list. Over the duration of a week I successfully added all but 6 of my follower list progressively with the import script in Pleroma smart enough to not create duplicates. Exporting my “Toot” history proved impossible through the web interface in Mastodon. I tried many times and it failed every single time.